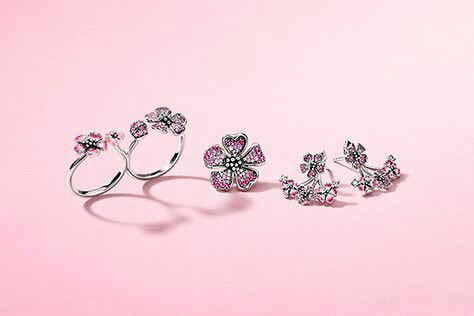 Spring blooms with a new PANDORA Peach Blossom Collection, exclusive to Hong Kong, Macau, Taiwan and Mainland China. In Eastern culture the peach blossom is believed to bring luck love and symbolises serendipity, dreams and good fortune. 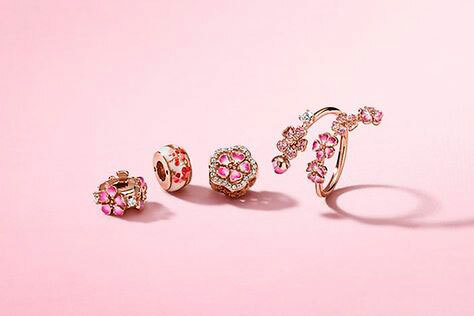 Hence the new PANDORA Peach Blossom Collection is sure to be a big success in China but I am a little sad it won’t be globally released as I adore the juxtaposition of PANDORA Rose, fuchsia pink and delicate blooms. 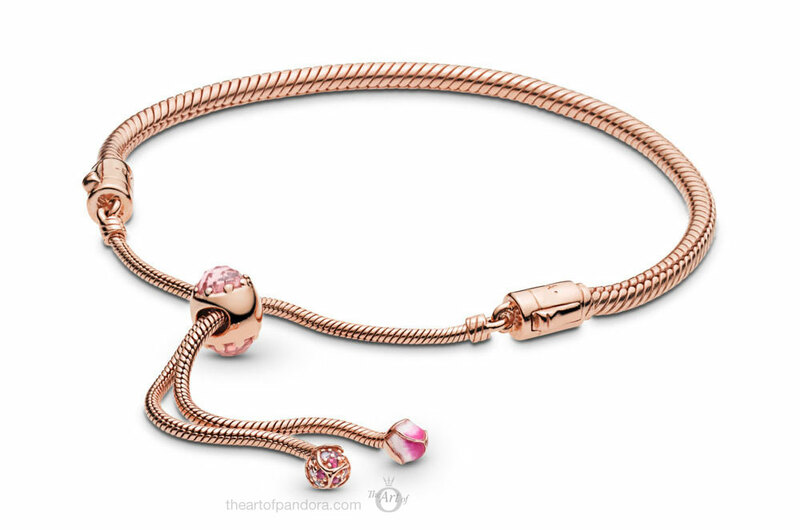 The PANDORA Rose Sliding Bracelet is back with a twist! Notice the rose pink crystal on the sliding clasp and intricate buds featuring handprinted enamel and synthetic sapphire stones. 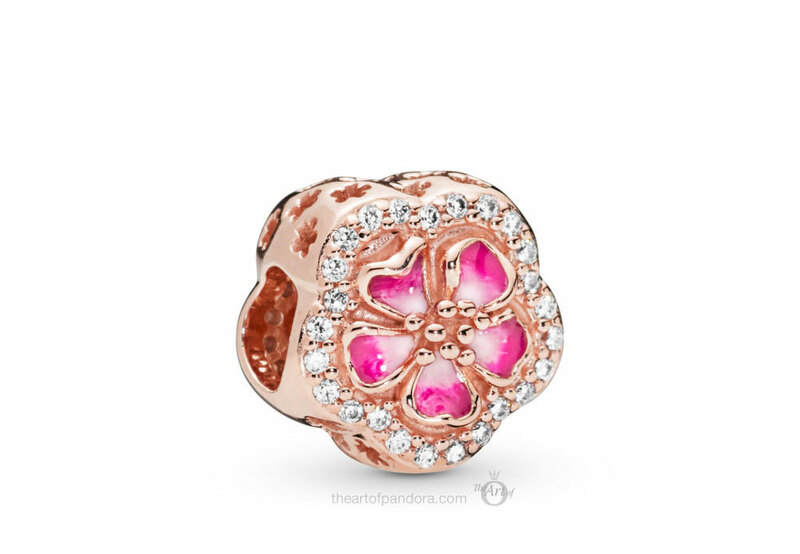 At this centre of the flower shaped PANDORA Rose charm a Peach Blossom unfurls it’s petals. Vivid cerise enamel fades into a soft pink centre and is surrounded with clear cubic zirconia stones. Notice too the tiny little cut out flowers decorating the side of the charm. 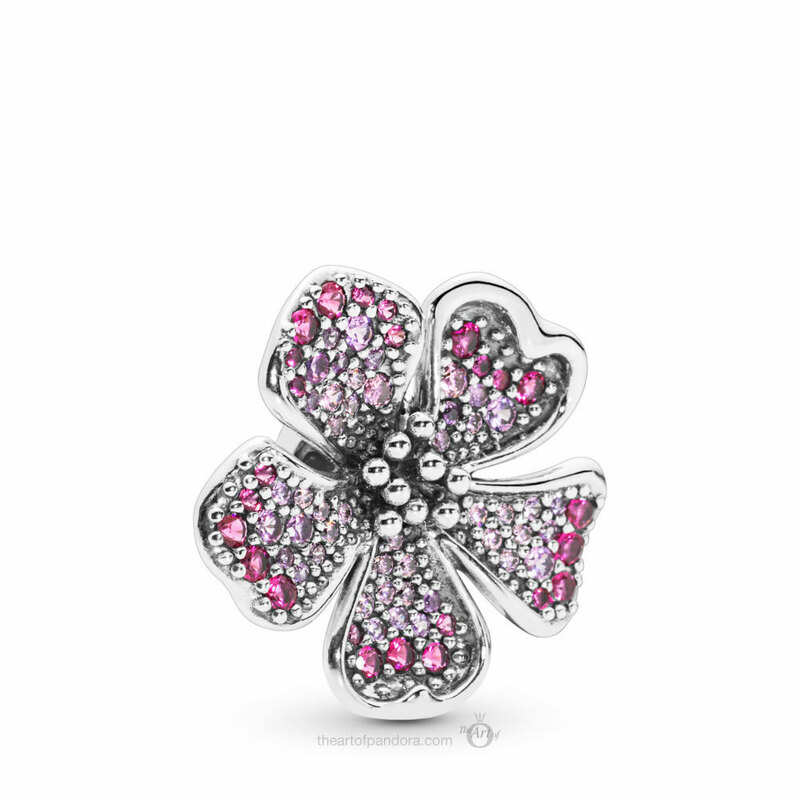 Brightly coloured peach blossoms burst over the extremities of this beautiful PANDORA Rose Clip. 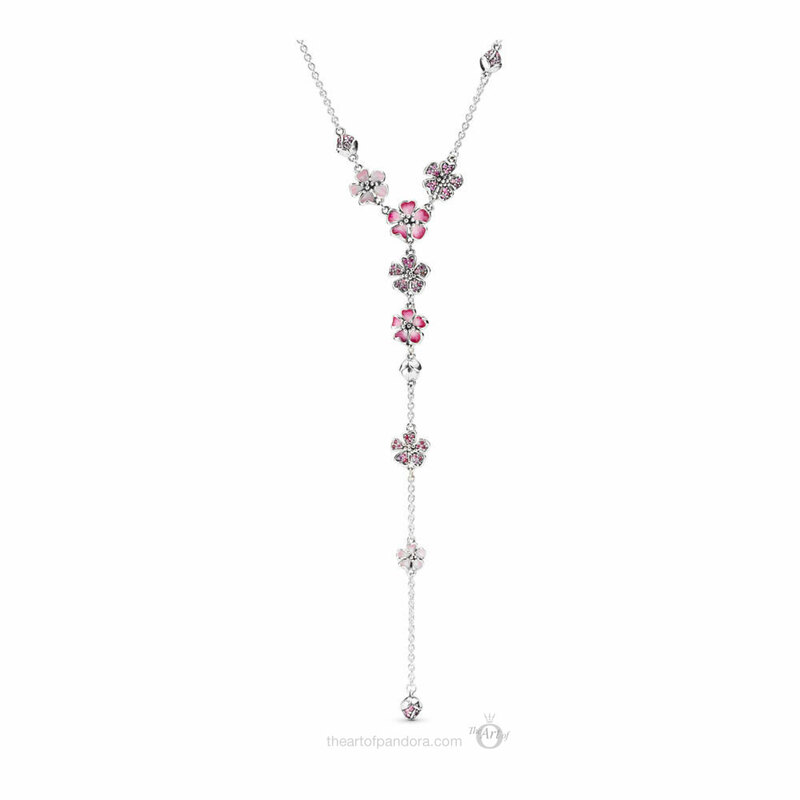 Clear cubic zirconia stones intersperse with the pink enamel blooms and resemble drops of dew. With it’s silicone centre this clip is ideal for the new PANDORA Rose Peach Blossom Sliding Bracelet. 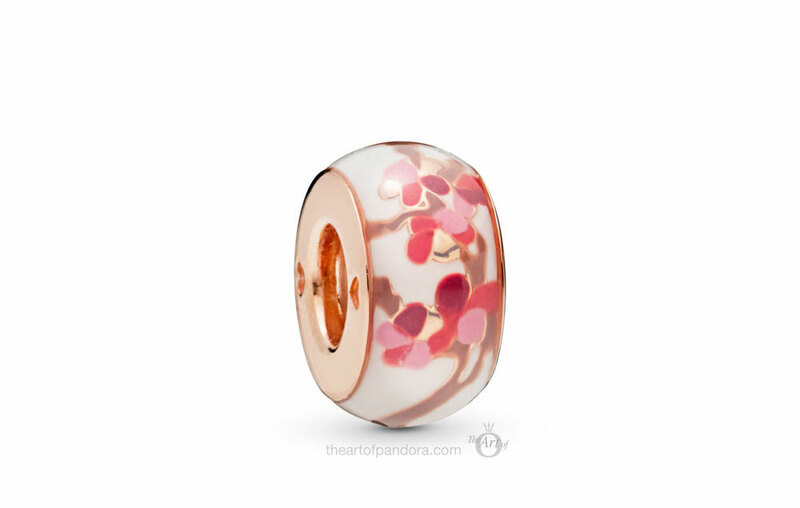 My favourite piece from the PANDORA Peach Blossom Collection is the stunning PANDORA Rose Spacer with a incredible pattern of peach blossoms in pink, red and brown on a white enamel. 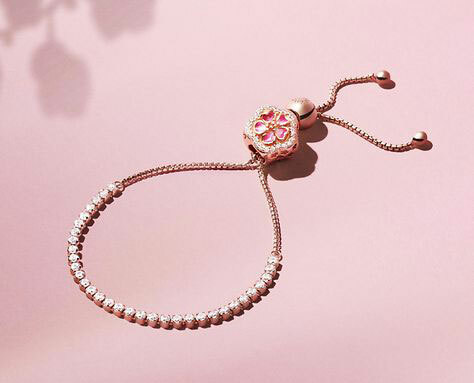 Continuing PANDORA’s recent trend of large feature charms is the new Big Peach Blossom Flower Charm which is set with cerise crystal, pink synthetic sapphire and pink cubic zirconia stones. 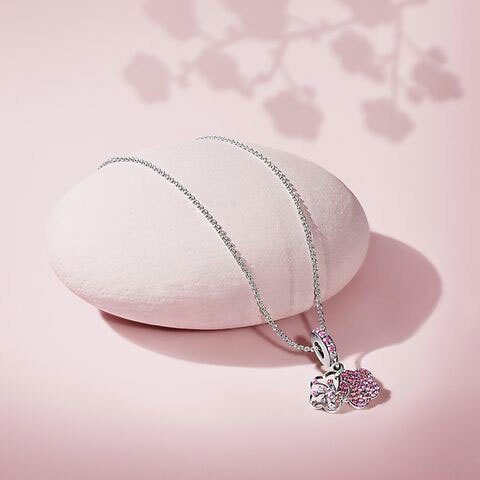 A peach blossom tree hangs in front of a shimmering flower filled with cerise pink crystals and synthetic sapphires. The bale is set with stones which graduate from dark pink to misty pink. 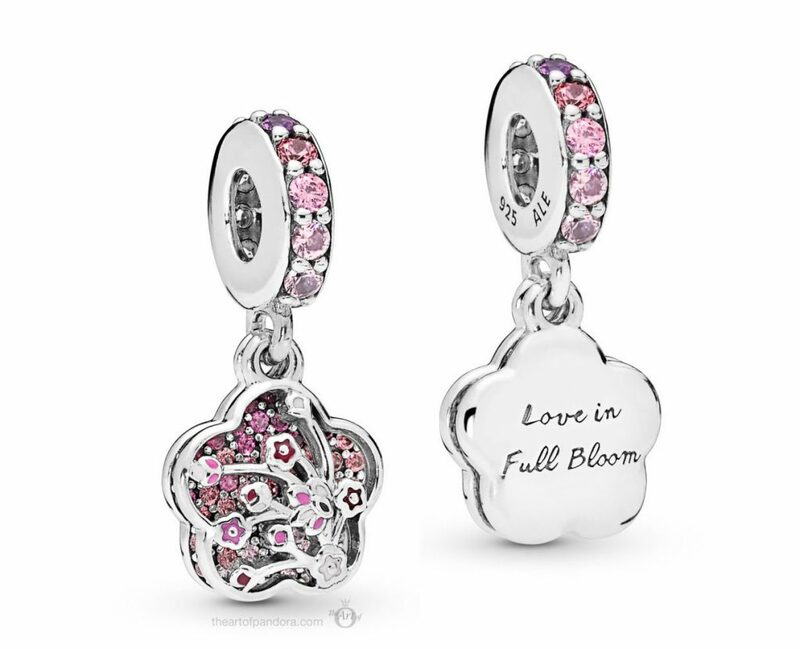 On the reverse of the charm is is sweet message ‘Love in Full Bloom’. 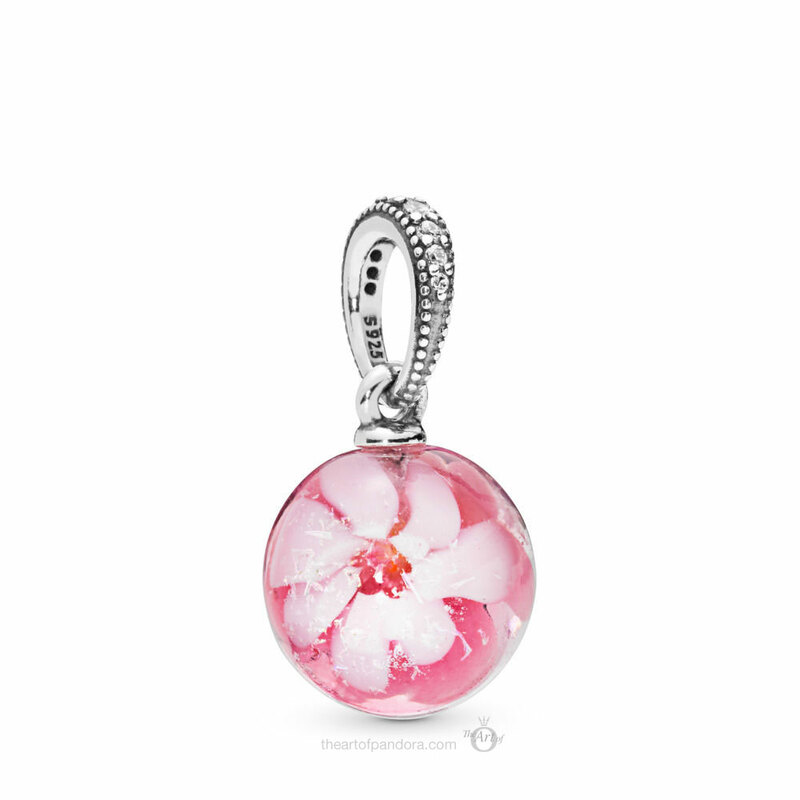 A single pretty peach blossom is submerged within a Murano glass orb hanging from a silver bale. 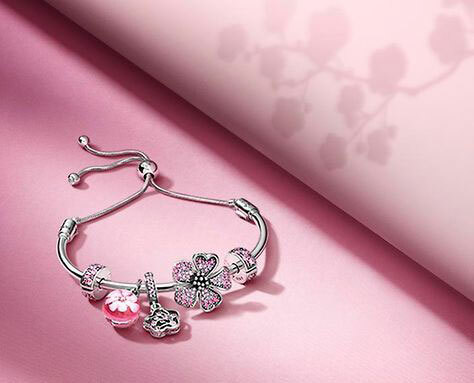 The new Chinese Flower Girl charm is in a similar style to the new grandparent and boy and girl charms. Dressed in a traditional outfit the Flower Girl wears pretty pink blossoms in her hair and holds a heart in her hands. Matching pink stones are set within the bale. 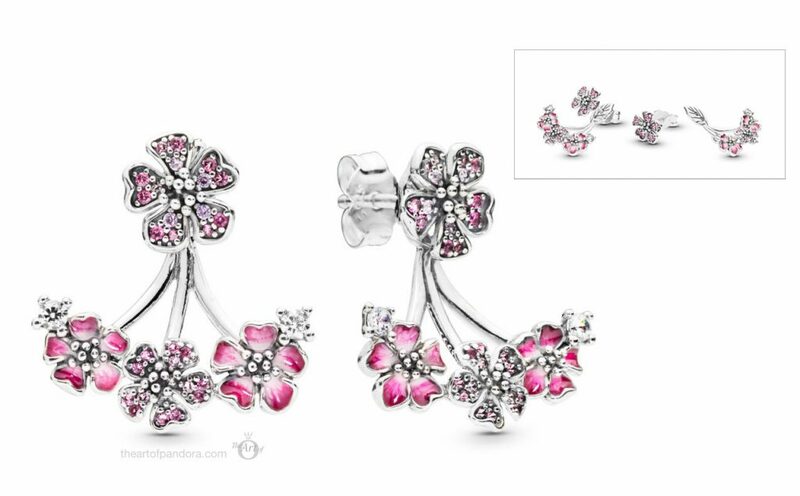 Three blooms curve beneath a single pavé peach blossom on these pretty pink stud earrings adorned with cerise pink enamel and mixed stones. 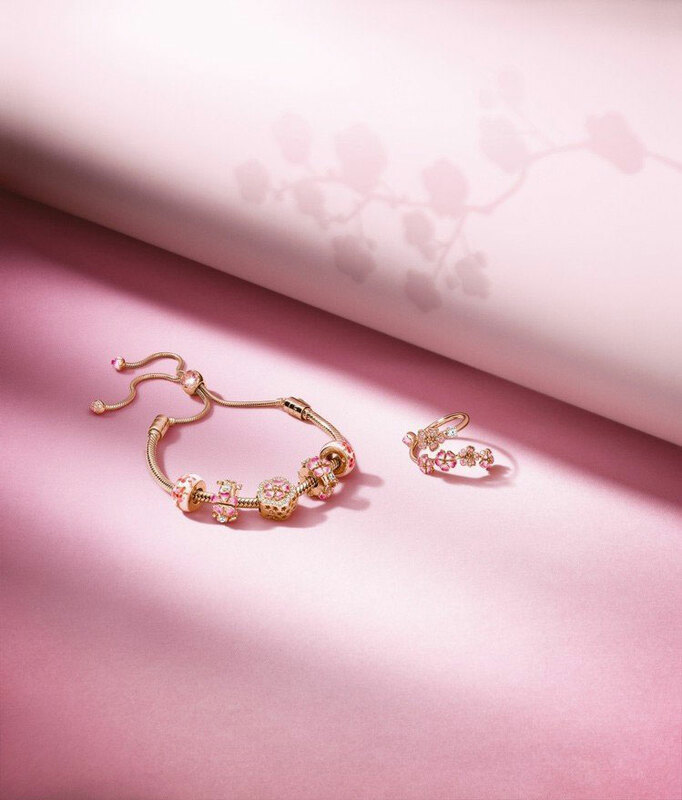 Delicate peach blossoms cluster together in these PANDORA Rose Earrings. They can be worn with our without the detachable earring jackets. A single flower bud swings from a silver ring set with cerise crystals, pink cubic zirconia and pink synthetic sapphire stones. Engraved on the inside of the ring is the message ‘Love in Full Bloom’. 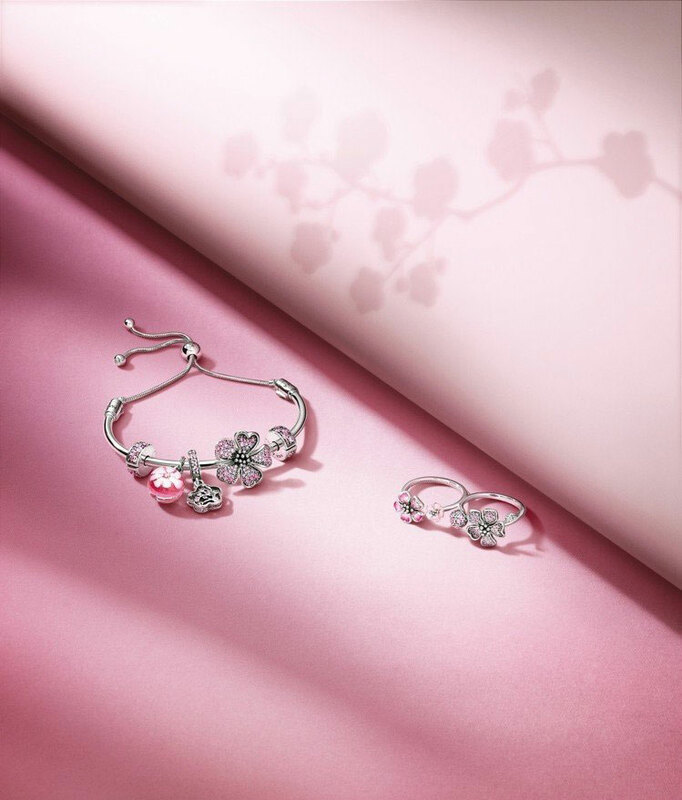 Pink buds and blossoms branch from a smooth PANDORA Rose ring. Misty pink crystals are set along side clear stones and cerise pink enamel. The new double finger Peach Blossom Flowers Ring is twice as pretty and adorned with cerise and fairy tale pink crystals. 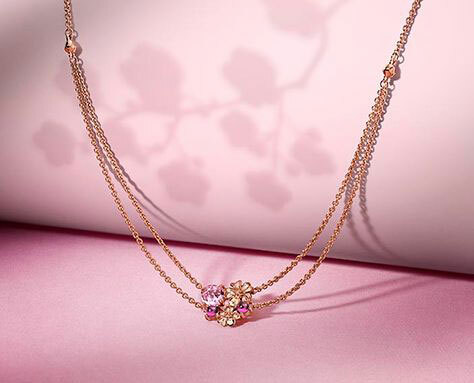 Two PANDORA Rose chains combine together to create a delicate layered look with cerise and pink mist crystals. 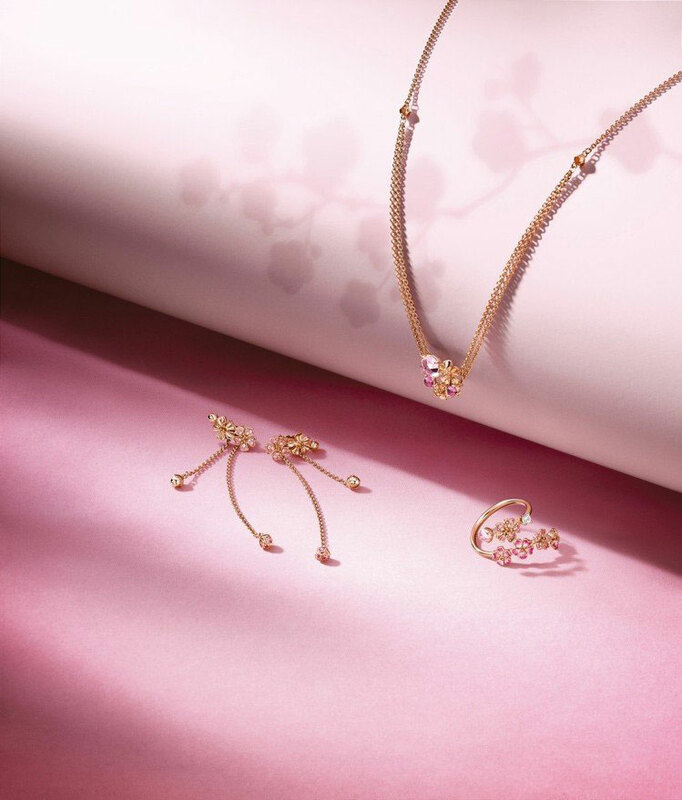 Delicate peach blossoms hang from this pretty silver Y-necklace with cerise crystal, pink cubic zirconia and pink synthetic sapphire stones. 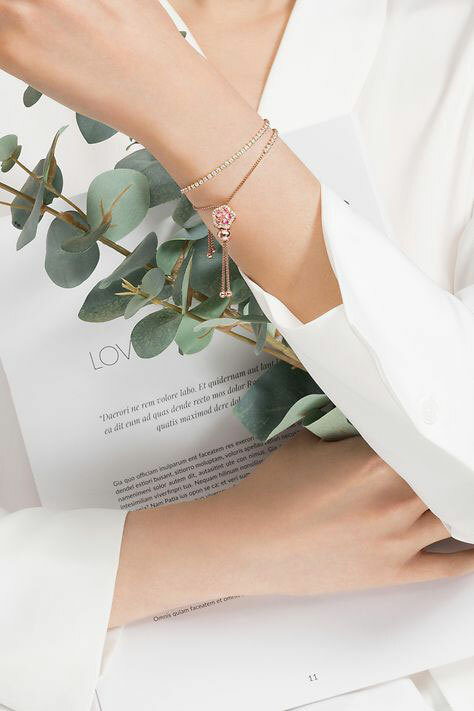 The PANDORA Peach Blossom Collection will be released on Thursday 11th April 2019 and is exclusive to Hong Kong, Macau, Taiwan and Mainland China. I love this collection. I am sad it’s not released in the USA. 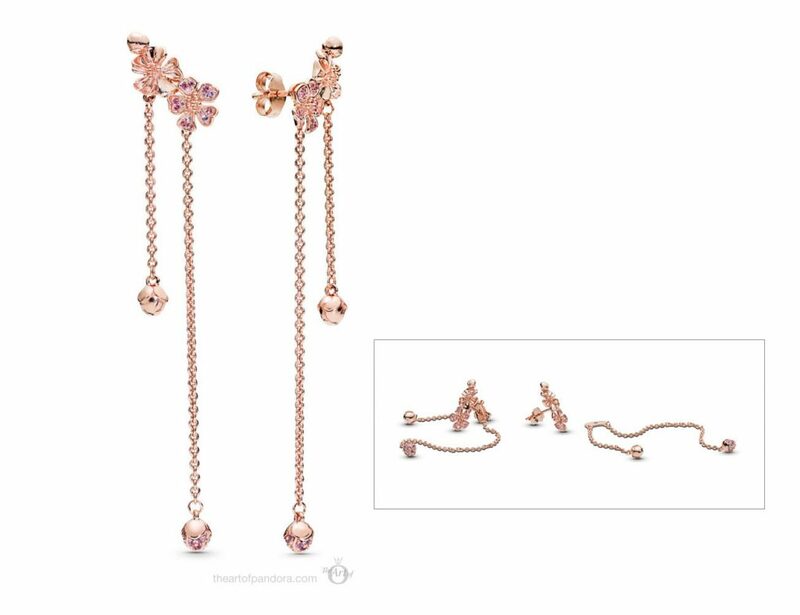 I especially love the peach blossom murano orb and the pave peach blossom flower charm. This collection is feminine and lovely. It is a stunning collection and works so well together. Sometimes when a collection is released it seems to have multiple themes or look over the top if all worn together but this collection is gorgeous. Ugh…when will companies learn it is now a global Marketplace. I would seriously buy all of the silver charms and probably a couple of rings if they would sell them in the US. I follow Pandora from a business standpoint and their sales woes should make selling merchandise worldwide Job 1. I’m sure no one would deliberately annoy you! You’re such a sweetie pie! Although they have unintentionally upset a lot of fans by only releasing this collection in China. Oh well at least Cindy’s local post office will be doing better if we all order from her!
. I much prefer this to the robots . Hopefully they are reading your comment as well as the other ladies who wish this collection had a global release. PANDORA are going through a bit of a transition at the moment so hopefully they are listening to their fans and taking note. These are gorgeous. Such a pity we won’t have them in South Africa. It is a shame. Maybe once PANDORA see how successful the collection is received in China it will be released elsewhere. OMG you are absolutely right My wishlist keeps growing eheheh! 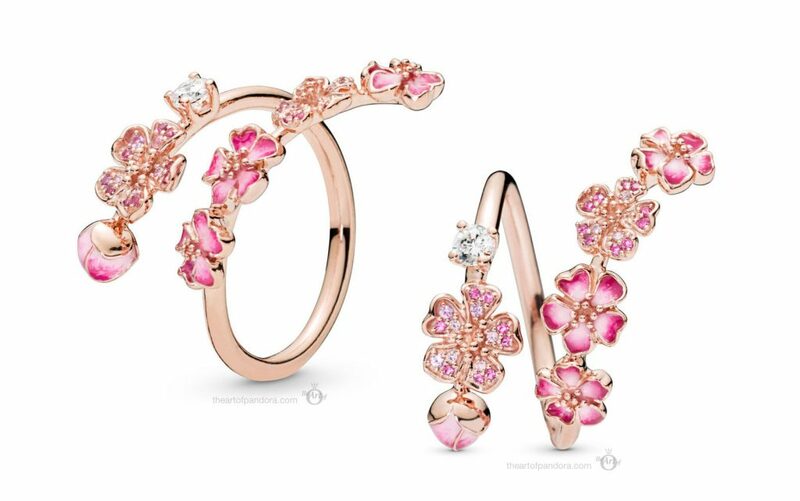 I generally am not interested in many of the newer cz-centric designs from Pandora but this collection is stunningly beautiful! As I was scrolling through the photos, I was kind of bummed at the focus on rose gold, which is not my favorite but was thrilled when I found they had several pieces in the collection in sterling. I remain hopeful that we will eventually see this collection in the US….if we all beg enough! I normally don’t like too much cz or enamel either, but this collection just seems to work! It looks like we will be having an exciting and slightly frustrating year from PANDORA! This collection is gorgeous. Its such a shame they aren’t releasing it in all countries. I would definitely buy some pieces. I think we are all unanimous on that! I am really thinking about getting two of the Spacers they are amazing! Thanks for commenting and enjoy your evening! I might agree with you if I wasn’t thinking about buying them and having them sent to me! PANDORA post is the best! If they only release in Asia, why do they have only English words on some of the charms? English is used in Asia a lot. Plus PANDORA’s engraving always seems to be in English even in non-English speaking countries. Hmmm, that is a good question! Maybe if we signed a petition we could send it to their headquarters? Is there a way to create online petition? I love all the silver pieces. Has anyone contacted Cindy Low to order? I am really thinking about it. I thought about it, I have not as I am not on Facebook. I think I’m gonna have to join you and follow! Wow! 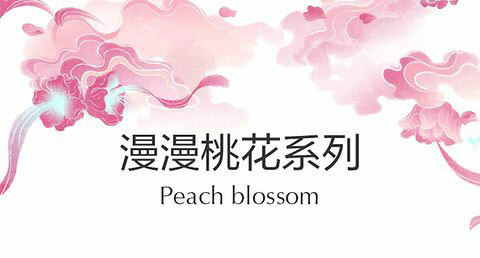 It is so Beautiful peach blossom collection! I love especially enamel flowers! All of pieces very beautifully detailed!!! Huge Thanks to you, Dora, for that preview! You are most welcome sweetie! I was worried I would be receiving hate mail when everyone saw that such a gorgeous collection was exclusive to China! Hopefully PANDORA will see how much their fans would like a global release and respond. Wow, Dora this collection is incredible – and so pretty! I love the Rose Spacer and sincerely hope PANDORA release it worldwide for us ladies to enjoy. The spacer is my favourite too. There is something very special about it and it has quite a classical feel. I need this collection, the Peach blossom is so… peachy! Such lovely jewellery I hope it will be released in the US also. Such a wonderful collection. Why is it only released in China? I am so disappointed, I hope they will release it in the US like they did the Fairytale Fish. It is entirely possible that they will change their mind and release it elsewhere but it might be a lot later. The Fairytale Fish was released in USA about 2 years after it’s original release. It will be interesting to see what happens but I think I’m going give in before then! These are so gorgeous!!! I hope it gets released in US! It is a really amazing collection! What is your favourite piece? This collection is beautiful I will have one of everything lol. I’m surprised that such a big collection is an exclusive it’s just a few pieces that they do as exclusives. Yes that is true. I think there will be a couple of exclusives coming up for the USA and Canada but as you say it will just be one charm. It is strange to put so much work and effort into one collection and not release it globally. I just love, love spacers!!!! thanks to Cindy soon i will have 2!!!! i wish that Pandora was available to everyone with all collections. The spacers are my favourite too! I am also tempted by the clips, especially as they have a silicone grip as it would mean they would work great on my PANDORA Rose Smooth Bracelet. 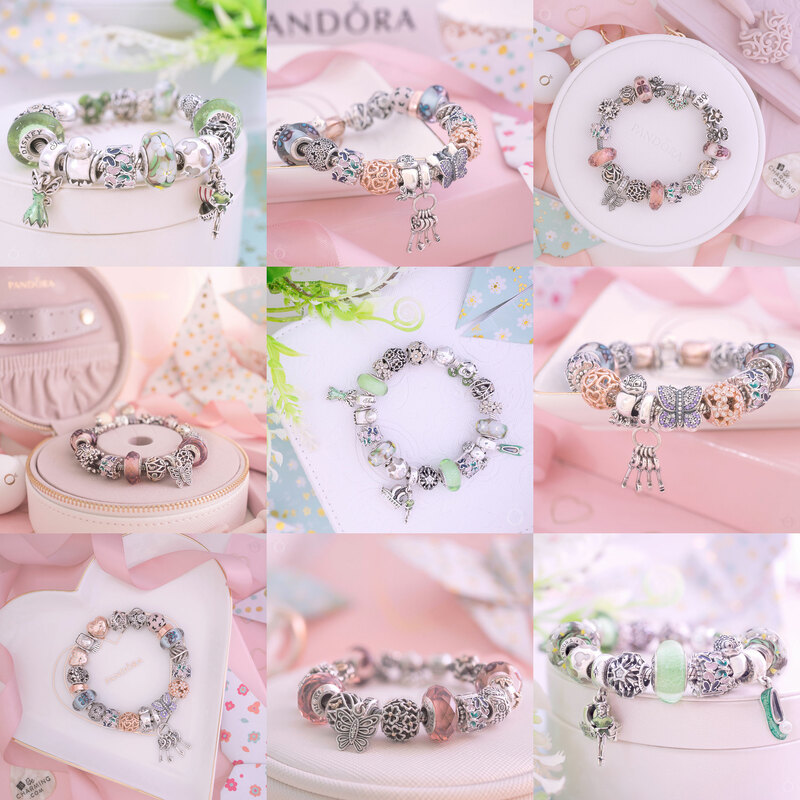 Enjoy your exclusive PANDORA goodies when they arrive! really hope they release this worldwide, this seems to be a collection that everybody really likes including me. I could see myself buying many pieces from this collection and I have not done that in a long time. hope that the powers that be are listening! any news on any promos coming up soon I live in the US. Thanks for all the work you do keeping us updated. Is really is a stunning collection! I have caved in and ordered two of the spacers from Cindy! I was trying to be good as I bought quite a few pieces from the Spring Collection but then my husband pointed out that the spacers will actually look pretty with a lot of what I have bought! So I can blame him this time. I don’t have any news yet on upcoming promos but I will post as soon as I hear anything. They seem to have managed to put a charm on the Rose Sparkling Strand sliding bracelet , how have they done that? It looks nice and I’ve been trying to put one there on my sliding bracelets but even though those come apart (I don’t think the sparkling ones come apart, they don’t need to) I still can’t get a charm where that one is in the picture . There’s a YouTube video, isn’t there always lol , and you do fold it where the sparkles join the sliding part . I searched for ‘how to put a charm on a sparkling strand bracelet’ . Definitely going to get one of those bracelets now, next time we have a 3 for 2 offer . I didn’t think of looking on YouTube! Its easy to do, you Can use all the moment charms. It is a pretty collection, but I can see why it is only released in Asia when I convert Hong Kong dollars to Canadian or US dollars. It is very expensive when I do that. I don’t think I would buy anything at those prices if they released it here! Hallo i live in Germany can I somehow order this from China ?